In the last post, we mentioned that one of the consequences of the fact that carbon can form rings is that small rings (less than 8 carbons) are so rigid that they can’t be turned inside out [video]. One of the important consequences of this, as we’ll see today, is that it leads to the formation of new types of isomers we haven’t seen before. Remember isomers? If you’ve gone through the first few chapters covering alkanes, no doubt you have. The most familiar kind of isomer to us right now are constitutional isomers. These are molecules that have the same molecular formula, but different structural formula. In other words, different connectivity. A simple example is for C4H10, where we have n-butane (a straight chain of 4 carbons) and 2-methyl propane (with a longest chain of 3 carbons, and a methyl group attached to the middle carbon). Of course an easy way to remember constitutional isomers is to tie them back to cats. OK, let’s get back to the topic at hand. What do we understand so far about constitutional isomers and cyclic molecules? Here, both molecules have the same molecular formula but different connectivities. That’s why specifying “1,1” or “1,2” is important – it avoids ambiguity. An unambiguous name for a molecule is necessary in order to draw the structure perfectly from the name – just like an unambiguous address for your house is necessary to allow the postal service to deliver a letter to your door. Anything less and you get, “Return To Sender”. Funny thing about that. If you try to make a model of 1,2-dimethylcyclopropane, you might notice something. There are actually two of them! In one version, the two methyl groups are on the same face of the three-membered ring. In the other, they are on the opposite face. Since the three membered ring is rigid, we can’t interconvert the two without bustimicating the three membered ring. These molecules can’t be converted into each other without breaking the ring apart. The ring is too rigid. This means that the orientation of the groups on C-1 and C-2 are locked in place. Therefore they are two different molecules. In other words, they are isomers! That is, they have the same molecular formula (C5H10) but different structural formulae. (this is true for any two non-H substituents on C-1 and C-2 – not just methyl). What kind of isomers are they exactly? They can’t be constitutional isomers, since they have the same connectivity. We’ll need a different name. Since these two isomers of 1,2-dimethylcyclopropane differ only in their orientation in space, we call them stereoisomers. Let’s highlight this with a cat example : – ) . Look at the white legs in each case. Now: there’s actually a much more convenient way to draw stereoisomers than by using these 3-D perspective drawings. Except in certain cases (mostly bridged rings – we’ll get there a few posts from now) in organic chem it’s usually much more convenient for us to draw the flat versions of molecules. This presents a little problem. How do we give the illusion of showing three dimensions on a two-dimensional page? We’re going to do two things. First of all, we’re going to draw these molecules from the perspective of looking straight on at them, rather than from the side. In other words, look at them such that the plane of the ring will be in the plane of the page. Some groups will be pointing towards us, while others will point away. So we’re going to take some inspiration from everyday life to give the effect of distance. 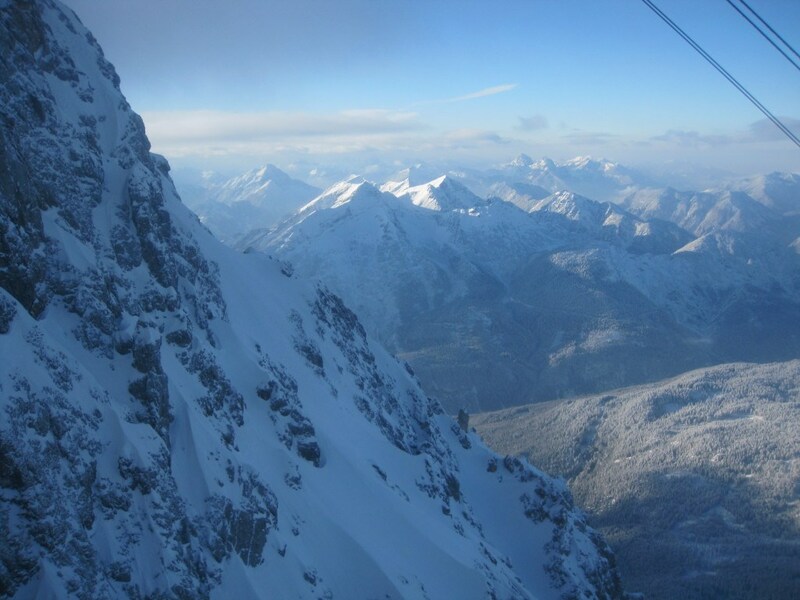 In this lovely picture of the Austrian alps, notice how the mountains close to us have well defined outlines and sharp contrast, whereas the mountains farther away are more faint. We’re going to use a similar visual trick. With the ring in the plane of the page, groups that point towards us are going to have a dark solid line (“wedge”) whereas groups that point away from us will be denoted with a dashed line (“dash”). Regardless of whether we look at the molecule on the left from the top or the bottom, we’d get the same thing. Just like whether you photograph a propane tank from the top, the side, or the bottom, you’re still photographing the propane tank. One last illustration. We can apply this to other groups (and rings) beside methyls and cyclopropane, of course. Note that in the absence of dashes/wedges, the structures drawn would be ambiguous. In the next post, we’ll talk about another interesting consequence of ring size: a phenomenon known as strain. P.S. Some of these structures (not all) are not even fully made unambiguous by the terms “cis” and “trans”. 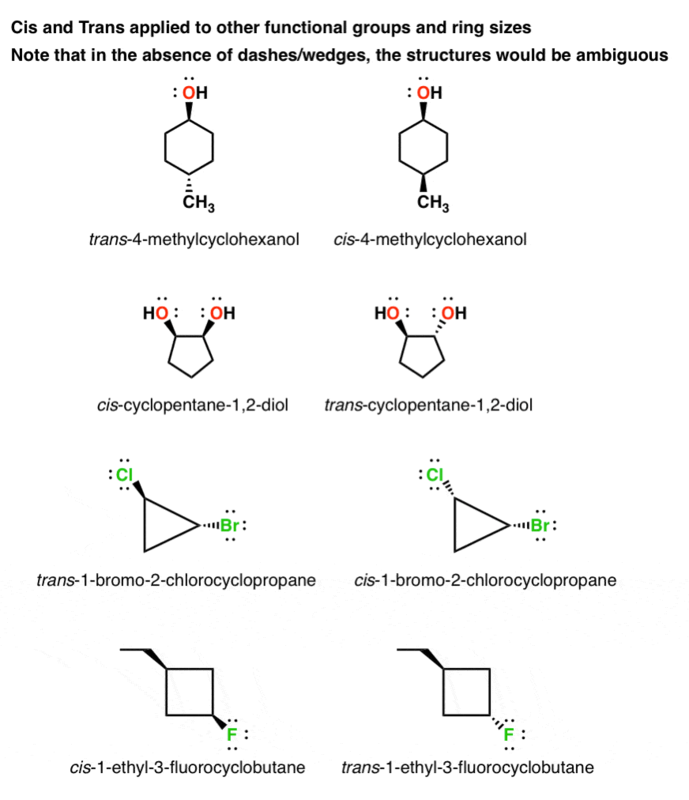 There’s an even deeper level of nomenclature we’ll need to describe, for example, trans-1,2-dimethylcyelopropane. If you’re really keen, you might be able to find it. If not, we’ll talk about it in future posts. Just wanted to point out the word is not bustimicating but busticating. I’m Canadian, we use the longer version of words up here. In the YouTube video you mentioned at the beginning, you say that cyclohexane is conformationally locked. Then how does it undergo ring flip. A cyclohexane ring is *configurationally* locked. Meaning that groups can’t flip on to the other *face* of the ring. i.e. we can’t do a ring flip to convert (for example) cis-1,2-dimethylcyclohexane to trans-1,2-dimethylcyclohexane. A “ring flip” just interconverts which groups are axial and which are equatorial.